This entry was posted in Blog News News: Politics and tagged blog news News: Politics on June 27, 2014 by Tom Grundy. The Girl Guides Association has signed a statement placed in the South China Morning Post calling upon its readers to think of the city’s children. It is unclear if the advertisement was taking aim at the ongoing civil referendum, the pro-democracy Occupy Central movement or both. Girl Guides Hong Kong have refused to comment or answer questions related to the matter and it remains unclear whether their involvement is reflective of the views of the young women it represents. 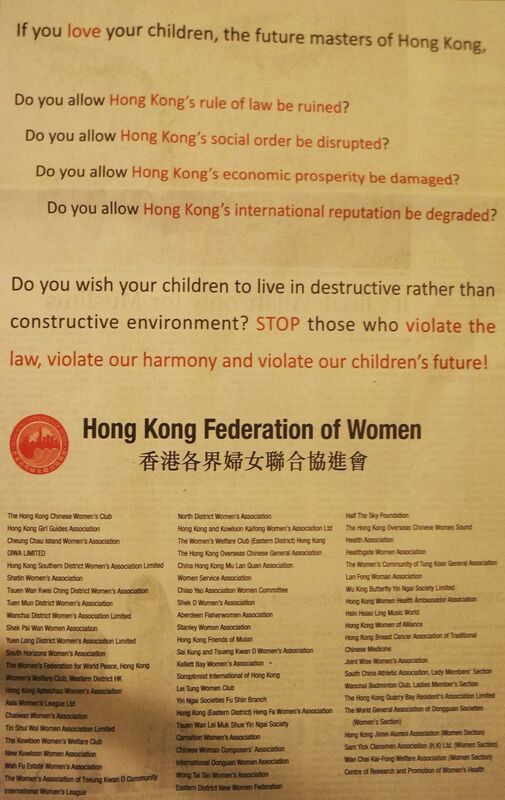 Most other signatories, under the umbrella of the Hong Kong Federation of Women, are local community associations but also include a number of health and sports organisations. Earlier this month, the normally apolitical business chambers of Hong Kong, Bahrain, Italy, India and Canada published a statement condemning the proposed pro-democracy ‘sit-in’. The British, American and Australian chambers were not listed, whilst the Hong Kong Stock Exchange has stated, separately, that it expects any acts of civil disobedience to have a minimal impact on trade.